After 8 hours of non-stop work, I can officially say the haunted trail is officially tore down! It is going to be a few more days before all the batteries are removed and the decorations get stored away until next year. The primary reason for the delay is everything has to dry out thanks to a heavy rain that started just as the party was breaking up. We headed down for the official lighting of the flaming pumpkin and it started to sprinkle. The tree canopy shielded the trail from the light rain, but by the time we made it back to the house it was a full on downpour for most of the remaining night. By the way, it isn’t a Midwest Halloween until a carved pumpkin full of Kerosene is sending 4 foot flames out the top! Seems like a fitting time to feature another form of bright light. I am guessing one of my followers already recognized this particular lighthouse. 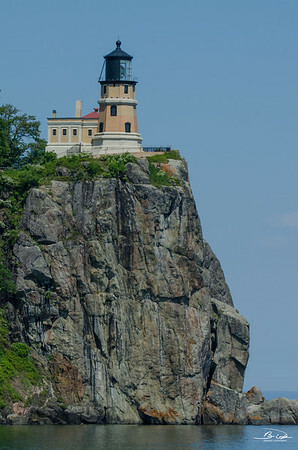 For those of you not familiar with it, this is the Split Rock Lighthouse. We discovered it on our Waterfall hunting vacation along the coast of Minnesota back in July 2017. Ironically, if I recall correctly, it was raining a lot that week as well. Seems to be a lot of water related events seeing as we just drilled a new well a few weeks ago. Anyway, my wife is the big waterfall photographer and planned our trip up the coast in an attempt to get some in the tin to add to her portfolio. Think I mentioned this before, but she is a big photographer as well. While I focus on feathers and fur, she prefers landscapes and dog agility/portraits. Every once in a while she will encroach into my domain (pretty sure she does it just to bug me). Two can play that game hehehe. Hit the jump to read a bit more about our lighthouse adventure. You probably noticed last month I focused a bit more on non-bird related posts (evident by the limited posts to the wildlife version of this blog). My readers have a diverse range of interests thanks to the many transformations this site has gone through over my 10 years of blogging. To keep everyone interested, I try my best to provide a range of topics, but clearly our feathered friends get the heavy feature lifting on this site. That means a bird post is never too far away… take for instance today’s featured subject.. This post comes with a word of caution. A typical post workday consists of combing through thousands of backlogged images trying to locate something interesting to share with my loyal readers. Additional time in the digital darkroom making it all pretty like and then some intimate time with a shelf full of reference materials. Once convinced of the probable ID, a quick screen grab is taken and a request for validation goes out to my brother Ron. He being a birding aficionado will take a quick look and confirm or call me out for trying to claim a fuzzy picture of a Robin as a Puffin (damn him and his crazy bird skills hehehehe). That is how it usually works. As of late, the request goes out and nothing comes back. Request goes out and nothing comes back. Sure, there is some claim about him being super busy with his day job, his analytics software, his book writing, his cult .. whoops make that nomography work, his blog, his bird excursions, his Halloween prop building, his family time, his photo process blah blah blah – I need my validations!!!!! Just kidding of course, he has so many irons in the fire now guessing he has given up all aspirations of sleep. In the meantime, going with an ID that is pretty certain. This, ladies and gentlemen, is a Red-Breasted Nuthatch. It helps of course, that it a) actually has a red breast and b) was spotted walking DOWN a tree. 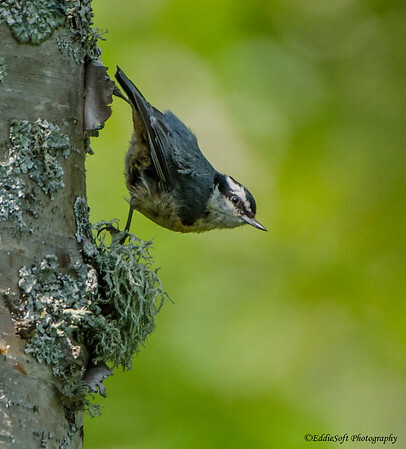 If you don’t know much about birds, it is a good bet if you see a bird making its way headfirst down a tree trunk, it’s a Nuthatch. Creepers will do that from time to time as well, however, they are very distinctive brown where the Nuthatches sport a spiffy grey. 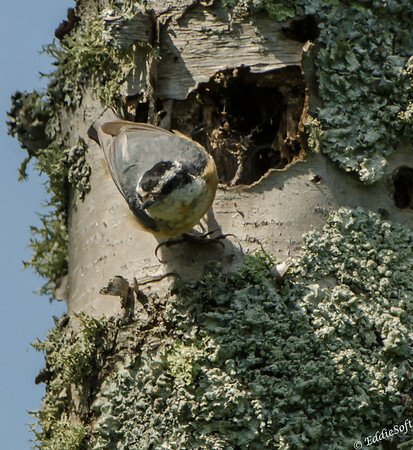 Common to my stomping grounds here in fly-over country is the White-Breasted Nuthatch. That one has … wait for it … wait for it .. wait a bit more for it … just a bit more .. and now .. a white breast. It does sport some chestnut on the shoulders and lower belly but for the most part white. Already have the White-Breasted version. Then there is the Brown-Headed variety. Yes, they do have a brown head (more like a brown cap from my perspective). Next time you see a brown capped bird walking straight down a tree – think Brown-Headed Nuthatch. If not already, you are going to become a birder if you continue reading this blog whether you want to or not. A little secret – there are photos of this variety in my queue as well so yeah, that one is half checked only waiting to make its debut on this blog. The last of the 4 is the Pygmy. That one is still on the hunt list. Still extremely happy with 3 out of the 4.Hatches. Just realized the shot location hasn’t been mentioned. We found this on our recent trip along the Minnesota Lake Superior coastline back in July 2017. 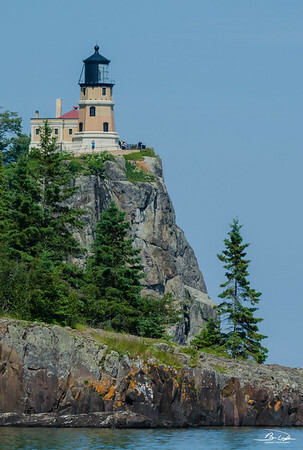 To be specific, at Split Rock Lighthouse State Park near Two Harbors. After parking in a lot south of the lighthouse, we made our way down to the coastline to get some shots of the building. Note to future visitors, if are not interested in paying to get up close to it, simply head own to the parking lots that have access to the coast or catch the pull off overlook further south. While walking down the trail, this specimen flew past me and latched on to the pictured tree. The lighting was horrible – in the light, out of the light as it wandered up and down the tree. Ended up only getting a few shots of it, but clearly good enough to claim the new +1. Yikes, way out of pictures – let’s hunt up some facts. First off, the Red-Breasted Nuthatch is nimble enough to walk straight down tree trunks, but you know that now don’t you hehehe. 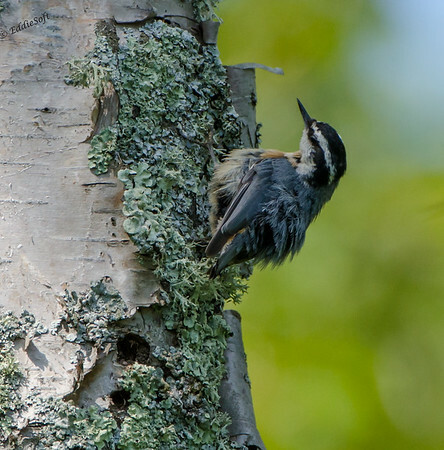 Only other worthwhile tidbit from Cornell’s site is they utilize “resin globules” obtained from coniferous trees to protect their nests from predators. Immediately thought Ghostbusters and being slimed.